The Parade of "Green Homes" is a public-private partnership to renovate four homes, on a single block, with each home illustrating different energy and conservation related improvements, such as various insulating, heating and restoration techniques and materials. Additionally, each home illustrates building modifications that support specific directives for full accessibility, a beginning family, a home office, and a historically sensitive restoration. Sonoc Architects coordinated multiple planning and community meetings in partnership with the American Institute of Architects, multiple City of Chicago Departments, Neighborhood Housing Services Corp. and multiple neighborhood community organizations. 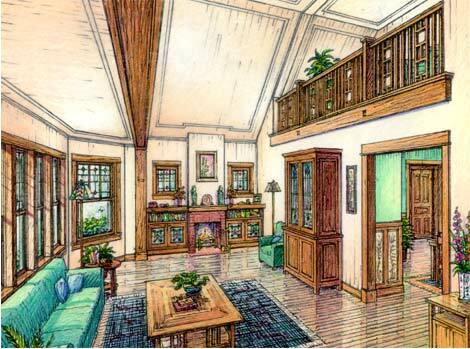 Sonoc provided architectural concept sketches and produced final construction drawings and specifications for each home. Additionally, Sonoc provided Streetscape drawings, including revised parkways and curbs, street furniture, and gateway signs to identify this unique neighborhood housing revitalization.